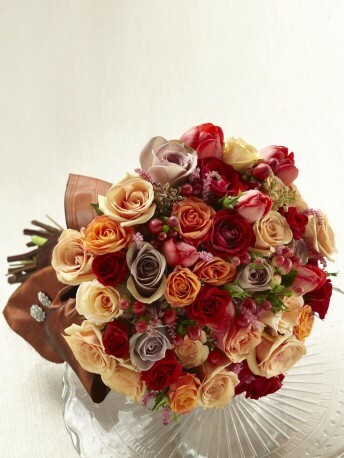 Bursting with sunlit beauty, this bouquet of peach roses, antiqued lavender roses, antiqued red roses, pink astilbe, red hypericum berries, bi-colored red and white roses, Cherry Brandy roses, orange spray roses, red spray roses and seeded eucalyptus is tied together with a dramatic chocolate satin ribbon to give you an incredible look as you glide down the aisle. Approx. 12-inches in diameter.